Typical summer pickings at Rainham Marshes RSPB on Saturday 18 July 2015 with passage waders present in the form of singles of Black-tailed Godwit and Whimbrel flying onto the reserve with the afternoon rising tide. Before this a walk to the Serin mound in the morning was quiet with a few Common Terns working Aveley Bay. The birding soon livened up as a couple of Buzzards circled the Silt Lagoons / Wennington Marsh, and then a glance upwards produced a nigh on immaculate Red Kite gliding west. It started to circle Wennington Marsh, quickly gaining height before changing to a fast glide following the Thames up towards London at 10:30. Departed Serin mound with a Hobby zooming through onto the reserve. Back on the reserve dragons and damsels were the order of the day. 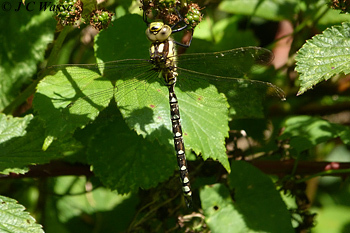 A smart looking Southern Hawker patrolled a part shaded area of the woodland boardwalk before resting allowing for further study and photos. Black-tailed Skimmers and Emperor dragonflies shared the Dragonfly Pond and Small Red-eyed Damselflies were present along the southern boardwalk channel. Vying for attention were Marsh Frogs who got noisier as the day warmed up. Video of the Red Kite as well on Surfbirds linked to at 'UK Birding Videos (Surfbirds)'.